Oct 30, 1986 - rats (Charles River Breeding Laboratories, Wilmington,MA) weighing. 200 g were ..... Jacobs, H., A. Jobe, M. Ikegami, and D. Conaway. 1983. 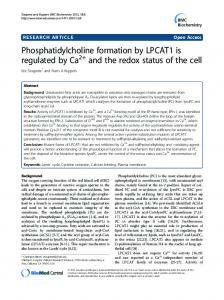 Phosphatidylcholine Hydrolysis by Phospholipase D Determines. Phosphatidatle and Diglyceride Levels in Chemotactic. Peptide-stimulated Human Neutrophils. 59. Platelet-Activating. Factor Mediates. Phosphatidylcholine. Hydrolysis by Phospholipase. D in Human. Endometrium1. ASIF. AHMED,2'3. RU! A. FERRIANI,3. Background. Unsaturated fatty acids are susceptible to oxidation and damaged chains are removed from glycerophospholipids by phospholipase A2. Oct 9, 2003 - Department of Life Sciences, Graduate School of Arts and Sciences, The .... incubated under HL conditions (white circle) for 120 min, and. 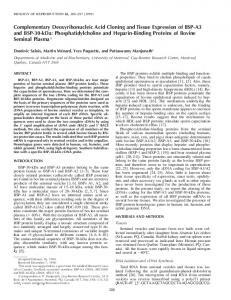 yeast and mammalian mitochondria (MacDonald and Mc-. Murray ... (MacDonald and McMurray, 1980). To save .... Dr. William Dowhan for plasmid pPGL3008. Dominic Salois, Martin MÃ©nard, Yves Paquette, and Puttaswamy Manjunath2. Departments ...... Ausubel FM, Brent R, Kington RE, Moore DD, Seidman JG, Smith. Saturated phosphatidylcholine and phosphatidyl- three alternative synthetic pathways(de nouo synthesis from glycerol are important components of pulmonary sur- saturated diglyceride, deacylation-reacylation ( 7 ) , and deacface active material. We studied the synthesis of these ylation-transacylation (8)), remains uncertain, partlybecause two phospholipid classes by alveolar type I1 cells in it is difficult to interpret biochemical studies performed on a primary culture. During a 20-h incubation, type I1 cells tissue composed of many different cell types. The lung conincorporated a high percentage of glycerol, acetate, tains more than40 different kinds of cells (9);only 15%of the and palmitate into phosphatidylcholine (61.2, 76.4, and cells of an adult rat lung are type I1 cells (10). It is therefore 76.8%of lipid radioactivity, respectively) and into phos- important to studyphospholipid synthesis in isolated type I1 phatidylglycerol (16.7, 5.8, and 6.6%). Acetate was in- cells. We previously developed a method of purifying type I1 corporated principally by de nouo synthesis of fatty cells by differential adherence in primary culture (11, 12). In acids rather than by chain elongation. We studied the thisreport, we show that type I1 cells inprimary culture pathways for synthesis of saturated phosphatidylcholine and phosphatidylglycerol with type I1 cells that synthesize saturated phosphatidylcholine and phosphatidylhad been in culture for 1 day. Palmitate was incorpo- glycerol and provide evidencethat thedeacylation-reacylation rated nearly equally into positions 1 and 2 of saturated pathway is important in synthesizing saturated phosphatidylphosphatidylglycerol, but predominantly (72%) into po- choline in vitro. sition 2 of saturated phosphatidylcholine. 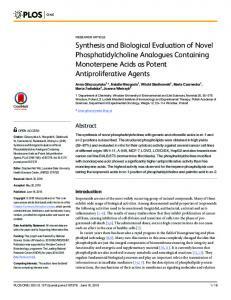 These data imply that saturated phosphatidylcholine is syntheEXPERIMENTALPROCEDURES sized at least in part by acylation of 1-acyl-2-lysophosPreparation of Alveolar Type I I Cells phatidylcholine. Alveolar type I1 cellsalso incorporated a mixture of saturated l-[9,10-3H]palmitoyl-2-ly- Alveolar type I1 cells were prepared from specific pathogen-free sophosphatidylcholine and 1-acyl-2-lysophosphatidyl- Sprague-Dawley male rats that weighed from 180 to 300 g (11, 12). [1,2-14C]choline from the medium by direct acylation Type I1 cells were partially purified by dissociation of intact excised rather than by transacylation. As the duration of cul- lung with crystalline trypsin and centrifugation of the resulting cell ture increased beyond l day, type I1 cells incorporated suspension over a discontinuous density gradient made with albumin. a lower percentage of palmitate into phosphatidylglyc- A higher concentration of trypsin ( 3 mg/ml) was used for the experiments in Table I and Figs. 1 and 2 and a lower concentration of erol and saturated phosphatidylcholine. Pulmonary surface active material, which is synthesized and secreted by the alveolar type I1 cell, lowers the surface tension at the air-liquid interface within alveoli and thereby prevents alveoli from collapsing at low transpulmonary pressures (1-3). Two classes of phospholipids, phosphatidylglycerol and dipalmitoyl phosphatidylcholine, are found in unusually high concentrations in surface active material and in alveolar type I1 cells from adult animals. Dipalmitoyl phosphatidylcholine is thought to accountfor the stability andlow surface tension of the surface film (1, 2). The quantitative contribution of different pathways for the synthesis of dipalmitoyl phosphatidylcholine by type I1 cells is not established. 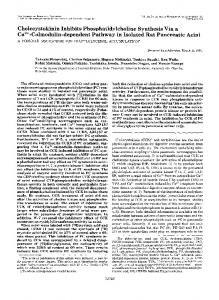 Studies on the synthesisof saturated phosphatidylcholine in whole lung and in subcellular fractions of whole lung have been reviewed recently (4-6). Most investigators agree that the serial methylation of phosphatidylethanolamine is not quantitatively important.However, the relative importance of * This work was supported by National Heart, Lung, and Blood Institute Program Project GrantHL-06285. The costs of publication of this article were defrayed in part by the paymentof page charges. “aduertisement” in This article must therefore be hereby marked accordance with 18 U.S.C. Section 1734 solely to indicate this fact. Former Established Investigator of the American Heart Association. trypsin (0.1 mg/ml)wasusedforallotherexperiments(12).The dispersed cells were further purified by differential adherence (11, 12). Cells were cultured in Dulbecco’s modified Eagle’s medium, 10% fetal calf serum, and antibiotics.For experiments in TableI and Figs. 1 and 2, we used 10 pg of gentamicin/ml and in all other experiments we used 50 pg of gentamicin/ml and 100 units of penicillin G/ml. Cells few were incubated for 3 h in a T-75 culture flask, during which time cells (mostly macrophages) attached to the plastic. The nonadherent cells were removed and, in most experiments, were placed in 35-mm tissue culture dishes with2.5 ml of medium and 2.5 X 10” cells/dish; during the next 20 h of culture, type I1 cells adhered to the plastic. Nonadherent cells (mostly lymphocytes and nonviable cells), were removedanddiscarded.Afterthedifferentialadherence,approximately 10” cells remained attached to each culture dish. Cells were quantitated by DNA determination (13); by this method, there is 8.3 pg of DNA/106 type 11 cells.’ T h e percentage of type I1 cells was determined from differential countsof cells stained with the modified Papanicolaou stain (14). Cells prepared with 3 mg/ml of trypsin and purified in culture yielded 83 -t 4% type I1 cells (mean -C S.D. ; n = 6) and cells prepared with 0.1 mg/ml of trypsin and purified in culture 4% type I1 cells ( n = 12). The total yield of purified yielded 94 adherent typeI1 cells from six rat lungs dissociated with0.1 mg/ml of trypsin was 10 to 15 x 10”cells. Incorporation ofAcetate, Palmitate, and Glycerol into Lipids During the period of attachment of type I1 cells, the cells were incubated with radioactive acetate, palmitate,glycerol or as described in the legend to Table I. ’ E. Geppert, unpubliihed data. Materials and animalsfor isolating type I1 cells wereobtained from the same suppliers as described previously (13). Culture media and fetal calf serum were obtained from the Cell Culture Facility of the University of California, San Francisco. Plastic culture dishes were from Corning Glass Works, Corning, N. Y. [U-'dC]Glycerol, sodium [l-I4C]acetate, [l-'4C]palmitic acid, [9,10-,"H]palmitic acid, and [ V I4C]choline were purchased from New England Nuclear COW., Baston, Mass. [1,3-"H]Glycerol was obtained from the Radiochemical Centre, Amersham, England. Fraction V bovine serum albumin was obtained from Miles Laboratories, Kankakee, Ill. Defatted bovine serum albumin, oleic acid, trioelin, phospholipase C, and pancreatic lipase were obtained from Sigma Chemical Co., S t Louis, Mo. Phospholipase AB(C. adamanteus) was purchased from Miami Serpent=ium,Miami, Fla. Phosphatidylglycerol was obtainedfrom Avanti, The abbreviations used are: Hepes, 4-(2-hydroxyethyl)-l-pipera- Birmingham, Ala. Silica Gand H thin layer plateswere obtained from Analtech, Inc., Newark, Del. All the organic solvents were reagent zineethanesulfonic acid; ME medium, minimal essential medium. Synthesis of the Phospholipids of Surface Active Mate- (dpm / p g DNA) rial-We tested the ability of type I1 cells in primary culture to synthesize the lipids of surface active material by incubating the cells for 20 hwith radioactiveacetate,palmitate,or glycerol. The results, which have been published in preliminary form in recent symposia (12, 26), are shown in TableI. The pattern of distribution of radioactivity in the various phospholipid classes is noteworthy for two reasons. First, the types of lipidssynthesized from these precursors are very similar to the phospholipidcomposition of surfaceactive material and alveolar type I1 cells from rats (12). Second, the pattern of distribution was the same when either acetate or palmitate was used as the precursor, a result which suggests that acetate is incorporated into fatty acids by d e novo synthesisratherthan by chain elongation.We determined whether acetatewas incorporated into fattyacids by de novo synthesisorchain elongationby incubating ceUs with [1-'4C]acetate, isolating the fatty acids synthesized from [I14 Clacetate, andcomparing the amountof radioactivity in the 0 2 4 6 carboxyl carbon (obtained by the Schmidt decarboxylation DAYS IN CULTURE reaction) to the amount of radioactivity in the remaining portion of the fatty acids. If acetate were incorporated into FIG. 1. Incorporation of palmitate into total lipid and disatfatty acids only by de novo synthesis and if palmitate were urated phosphatidylcholine (DSPC). Day 0 designates the day on the sole product, 12.5% of the radioactivitywould be found in which type I1 cells were isolated and placed in culture in 35-mmtissue the carboxyl carbon. If acetate were incorporated by chain culture dishes. Dishes were removed at 23 h for various analyses; this time is designated as Day 1 of culture. Three dishes were used for elongation and if only 1 acetate were added/fatty acid, all of palmitate incorporation, two for DNA determination,and one for the radioactivity would be found in the carboxyl carbon. We Papanicolaou stain. The rest of the cultures were re-fed with Dulfound 14.5 k 0.5% (mean -+ S.E. ; n = 4) of the radioactivity in becco's modified Eagle's medium and 10%fetal calf serum on Days 1 the carboxyl carbon. Therefore, typeI1 cells incorporate ace- and 3. For palmitate incorporation, the adherent cells were washed tate into fatty acids by d e novo synthesis under the conditionsand then incubated with 1.6 ml of ME medium/Hepes, 3 mg/ml of bovine serum albumin (34 pnol of mixed fattyacids/liter),and of these experiments. Because type I1 cells maintained in culture for more than2 albumin-bound [l-'4C]palmitate (4 pmol/liter, 0.2 pCi) for 2 h at 37°C. 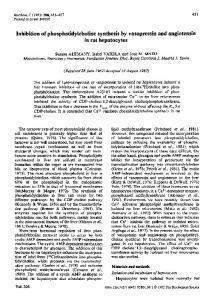 The cells were washed and the lipids were extracted and processed as described in the text. The mean f S.E. for triplicate incubations in one of two experiments is shown. DAYS IN CULTURE FIG. 2. Percentage tion, see legend to Fig. duplicate dishes were washed, the cells were extracted, and the lipids were processed as described in the text. In this experiment, there was 9.24 pg of DNA/culture dish (the equivalent of 1.1 x IO” cells/dish). Based on the assumptions that all fatty acids are esterified at an equal rate (28) and that the intracellular specific activity of fatty acids is the same as the specific activit.v of the fatty acids in the medium, the calculated synthesis of total phosphatid.vlcholine was 2.54 nmol/ 10” cells h-‘. The means of duplicate samples are given. 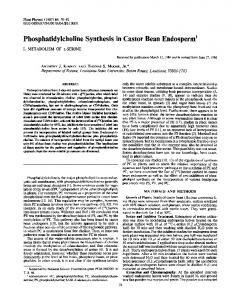 Report "Synthesis of Phosphatidylcholine and Phosphatidylglycerol by ..."